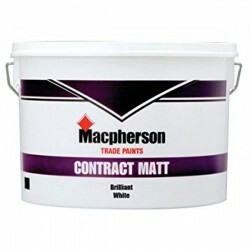 MACPHERSON ACRYLIC PRIMER U/COATA fast drying, water-borne acrylic primer undercoat with excellent o..
MACPHERSON BLACK GLOSS 1 LITREMacpherson Gloss is a high VOC content gloss finish. It is a washable ..
MACPHERSON BRILLIANT WHITE GLOSS 1 LITREMacpherson Gloss White. A durable high gloss finish. Based o..
CONTRACT MATT BRILLIANT WHITE 10 LITREObliterating emulsion with a matt finish for use on new plaste..
CONTRACT MATT MAGNOLIA 10 LITREObliterating emulsion with a matt finish for use on new plaster. Low ..
SANDTEX TRADE HIGH COVER SMOOTH MAGNOLIA 5 LITREA smooth masonry paint specially formulated for the ..
SANDTEX TRADE HIGH COVER SMOOTH WHITE 5 LITREA smooth masonry paint specially formulated for the pro..
MACPHERSON UNDERCOAT GREY 1 LITREMacpherson undercoat helps you get the most from Macpherson gloss ..
MACPHERSON UNDERCOAT WHITE 1 LITREMacpherson undercoat helps you get the most from Macpherson gloss ..
MACPHERSON VINYL MATT B/WHITEMacpherson Vinyl Matt White. An attractive finish that is tough and pra..
MACPHERSON VINYL MATT MAGNOLIAThe ideal choice for interior walls and ceilings where a modern flat m..